DUAL knee victim Paul Ahern has pledged to repay North Melbourne’s extraordinary faith in him after a “fairytale” 29-possession debut at Etihad Stadium on Sunday. 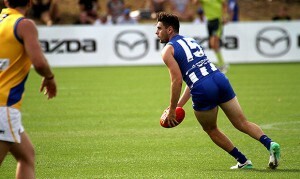 The Kangaroos shook Ahern out of the doldrums when they showed interest in acquiring the then-Giant in late 2016, only weeks after his second knee reconstruction in seven months. Greater Western Sydney originally drafted the 21-year-old seventh overall in 2014, but he didn’t play an AFL game for the expansion club in his two seasons there. Almost 1300 days passed – 1285, to be exact – between Ahern being drafted (then traded for pick No.65) and his celebrated first AFL game at the weekend. He rounded out his disposal tally with seven score involvements, five clearances, four inside 50s, four rebound 50s, three tackles and 381 metres gained in the 54-point thrashing of Brisbane. The timing of Ahern’s call-up after such a long wait was somehow perfect, given it was Sir Doug Nicholls Round and his grandmother hails from the indigenous Gunai-Kurnai people in Gippsland. “It’s so worth it at the moment. I obviously took the long road to get here, but to get a win with the boys is unreal,” he told AFL.com.au. “I was a bit surprised (to have so many disposals). I would have been happy if I had two touches, to be honest. The only downside was Ahern’s big occasion came a day after his ex-Calder Cannons teammate, Melbourne defender Jake Lever, ruptured the anterior cruciate ligament in his left knee for the second time. Lever sat out his final season at the Cannons recovering from the first of those setbacks before Adelaide selected him with the 14th pick, seven spots behind Ahern. North’s newest star reported that his own troublesome right knee felt “perfectly fine” and hadn’t given him any issues for “a long time”. “The first one I got tackled in an awkward position and felt a pop, and the second one was about seven months in and I joined training and went to push off and I felt it go again,” he said. “I want to thank North Melbourne for having full faith in me, to bring me in last year knowing I wasn’t going to play, and have no expectations on me. Ahern admitted his extended time on the sidelines was “a bit depressing”, but he believed his AFL dream was a reality again once he joined the Roos’ main training group in the pre-season. North’s medical staff and coaches gave him little indication of when he would be in the AFL frame, something he actually appreciated. “I think they just wanted me to get back and enjoy footy – and that’s what I did,” Ahern said. Coach Brad Scott told reporters post-match that Ahern, who averaged 23.7 possessions in six VFL appearances, demanded senior selection with his dominant state league performance a week earlier. Scott also reflected on the Kangaroos’ decision to make the inside-outside threat a trade target two years ago, saying it was “opportunistic”. “GWS had a rich list of midfielders who were all playing pretty good footy, and every club’s got to manage their salary caps,” Scott said. “It was just one where we thought, ‘Gee, if we can get him right, he’s got great capability’ – and we’ve got great faith in our medical team.